Mountview Falls is a Complex Classic Cascade measuring 10 metres (33 feet) in height and 1.2 metres (4 feet) wide. It is located on a tributary of the Chedoke system, and experiences impressive flow after rainstorms and the spring snow melt. Mountview Falls is an interesting waterfall from a few standpoints. 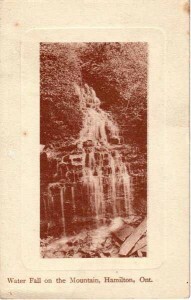 There is a vintage postcard dated 1908 (picture is on the right) depicting this waterfall. 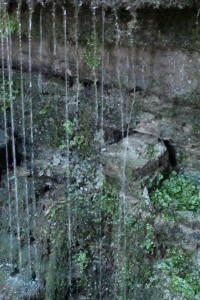 What is unusual is that there is no name. 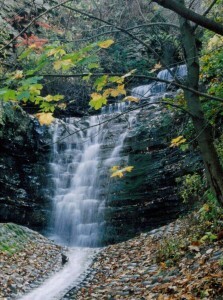 It is simply called “Water Fall on the Mountain, Hamilton Ont.” Therefore, a century ago Mountview Falls was known and photographed, yet nameless. 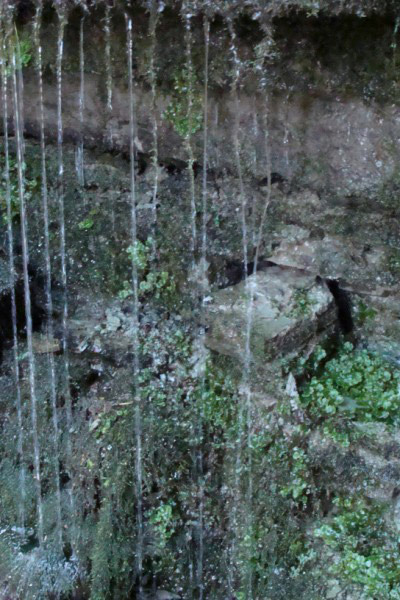 Joe Hollick, after thinking about this anomaly, realized why this waterfall was a photographers’ subject in 1908. 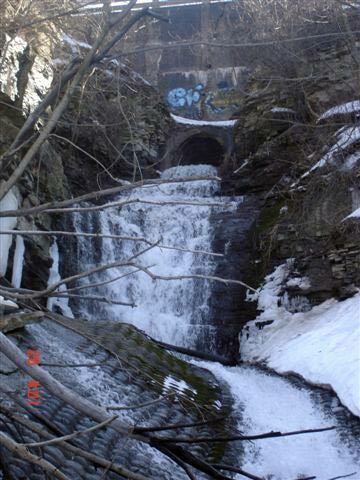 Many of the waterfalls in west Hamilton are accessible from the Chedoke Radial Trail, which is built on what was once the route for the Brantford and Hamilton Electric Railway. This particular railway began service to the neighbouring communities of Ancaster in 1907 and Brantford in 1908. By 1931 other modes of transportation had surpassed the train in popularity, so on June 30, the final run was made to Brantford using the same cars that had been used on the first trip in 1908. 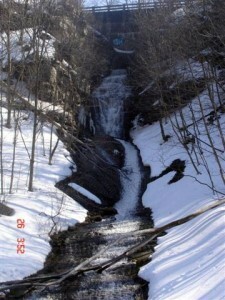 The tracks were removed the next year and the land as far as Ancaster was given to the Hamilton Parks Board in 1938. 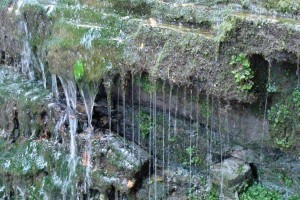 The 2.7 km strip forms part of the Bruce Trail. 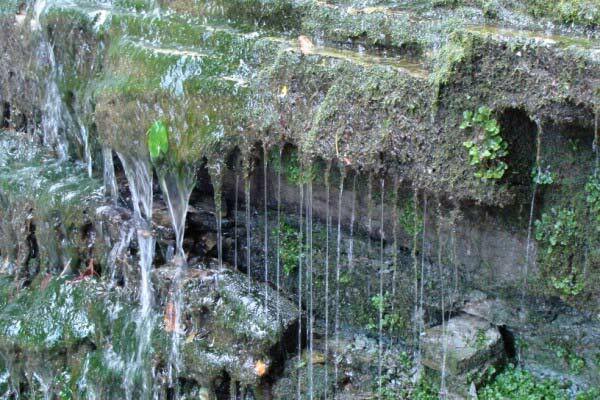 In 1995/96 the City of Hamilton developed the Chedoke Radial Trail for walking and cycling (and now waterfall watching). 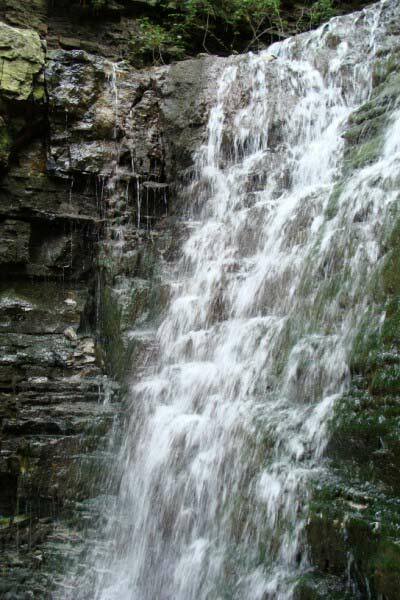 In 2002, when Joseph Hollick produced his first poster titled “Waterfalls of Hamilton Seasons”, Mountview Falls was included. 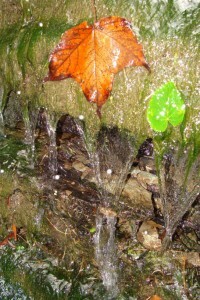 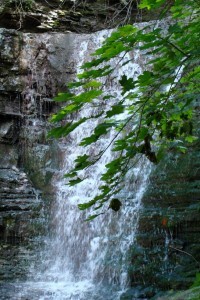 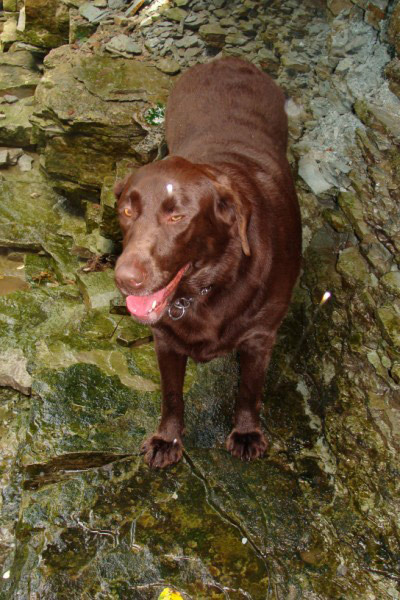 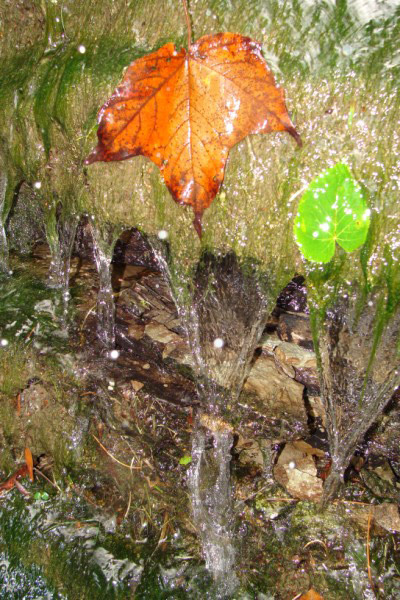 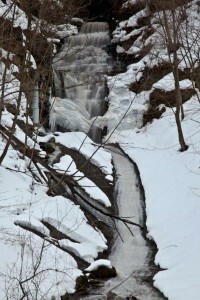 However, as he could not find a name for it, he referred to it as “Easterly Falls on Chedoke Radial Trail”. 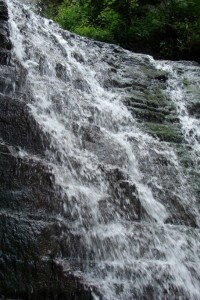 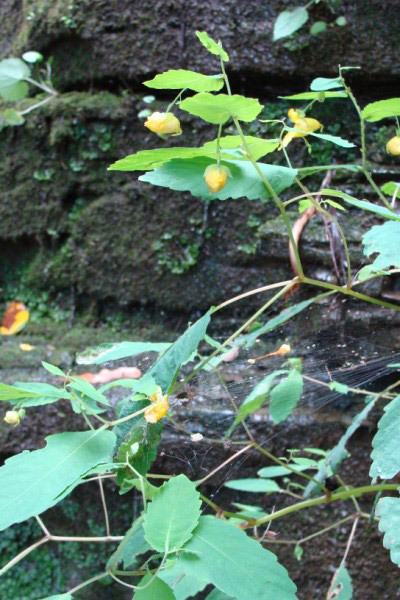 Mark Harris had listed the waterfall as Goulding Falls on his website in 2003. 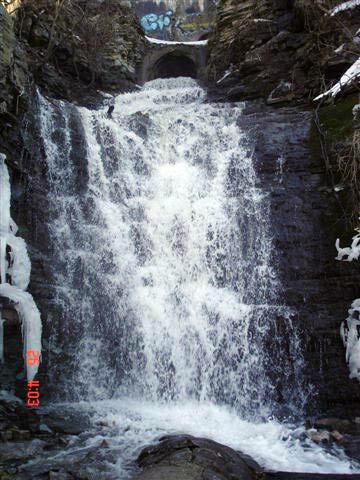 It was named Mountview Falls after the tiny community that used to exist at this location. 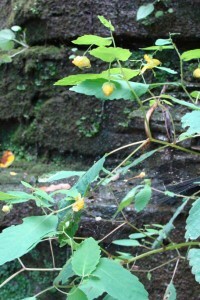 This is the name that it has been called ever since. 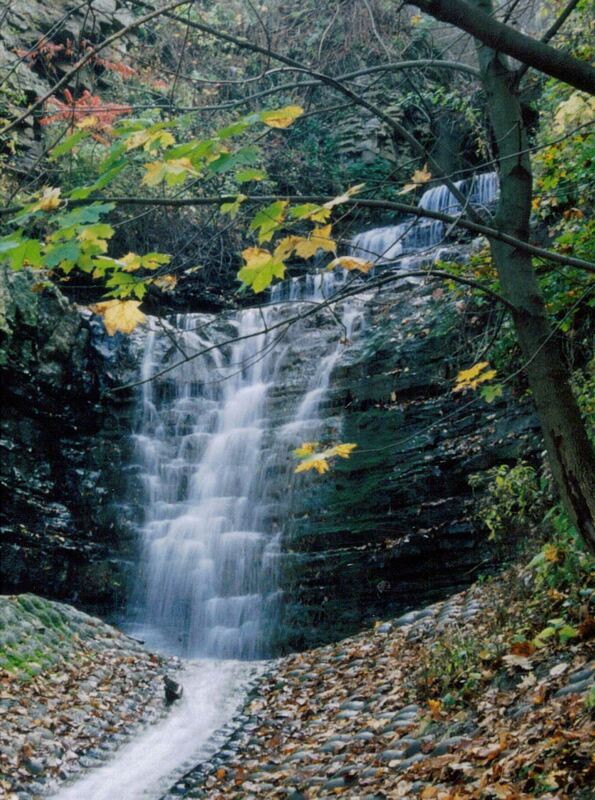 To access Mountview Falls, follow the same route you would take to get to Upper Princess Falls, only walk for fifteen minutes along the Chedoke Radial Trail instead of five. It is the second waterfall along the trail, Upper Princess Falls being the first.